Kiki Layne, Storm Reid and Yvonne Orji wore different GEORGES CHAKRA dresses yesterday evening(March 30th) at the 50th NAACP Image Awards at the Dolby Theatre in Hollywood, California. Kiki Layne is still on her winning style streak as she looked divine wearing a light blue airy silk-chiffon gown from the designer's SPRING 2019 COUTURE collection. Her flawless beauty look complimented her strapless, layered gown which came with a matching scarf. 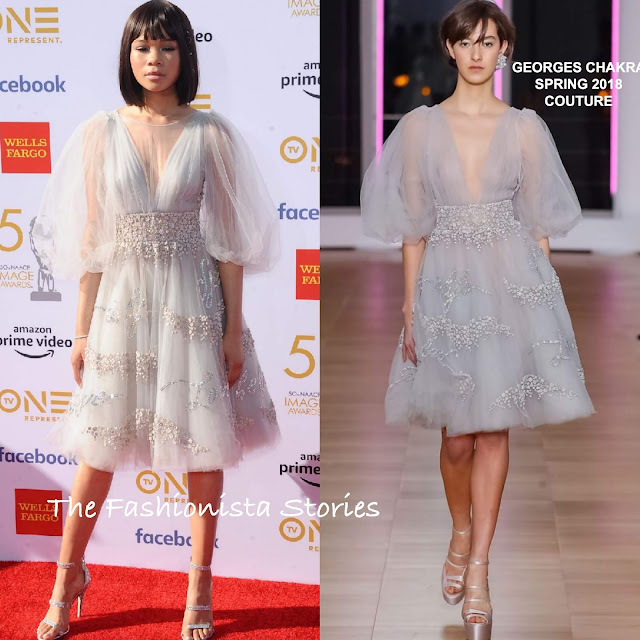 Storm Reid looked beautiful as well wearing a dress from the SPRING 2018 COUTURE collection. Her beaded organza, cocktail dress was accessorized with TAMERA MELLON sandals and topped off with a flawless beauty look. Letitia Wright walked away a winner wearing a FALL 2018 COUTURE black layered tulle embellished dress, which she styled with NICHOLAS KIRKWOOD sandals. 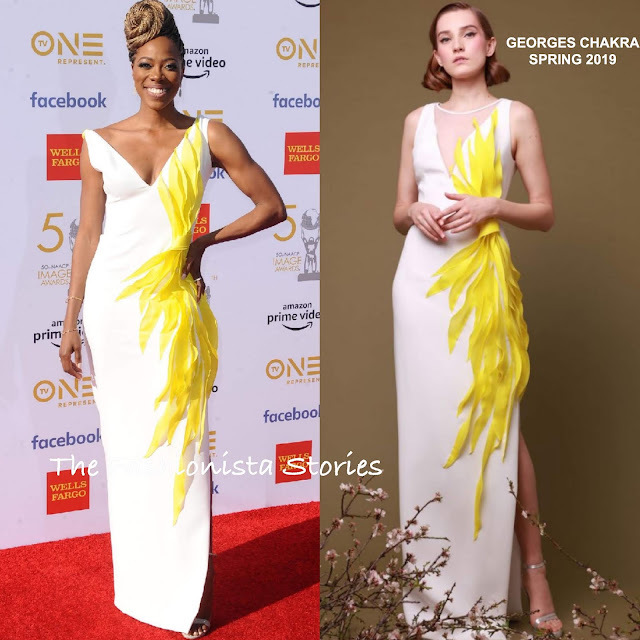 Yvonne Orji struck a pose wearing a SPRING 2019 white sleeveless floor sweeping dress, featuring a contrasting yellow organza panel. Thankfully the white sheer illusion panel was removed because the neckline works so much better on her open. She finished up with MONICA VINADER jewelry and a complimentary beauty look.